Table Runner uses our EZ Build 3 Inch Blocks as well as any other 3 other 3 inch block. Makes assembling and quilting blocks In The Hoop a snap! Totally pieced in the hoop and quilted in the hoop. Road to California variation - Finished Size 26" X 44"
Use your own 3 Inch blocks for this wonderful Table Runner or Wall Hanging. This version of the Table Runner DOES NOT include 3 inch block files. - If you DO NOT ALREADY HAVE our EZ Build blocks or your own 3 inch blocks order Table Runner Plus. Machine instructions for joining 3 inch blocks that begin at 3 1/2 inches and quilting them in the hoop(seam allowance is included) . The design includes only the assembly block for the Table Runner. ALL 3 INCH BLOCKS can be used regardless of how they were made. This means that if you have a collection of 3 inch blocks (should be 3 1/2 with seam allowances) you can use this file to assemble and quilt them in the hoop. 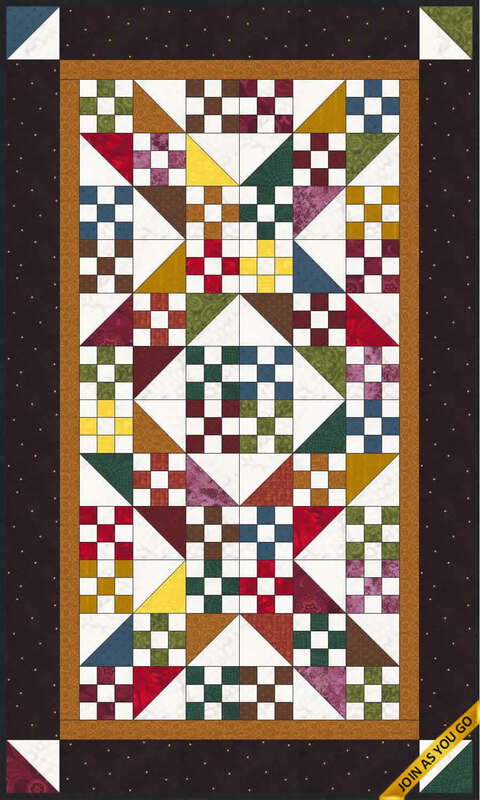 The assembly block can be used to make quilts of any size - not just the Table Runner shown in the image. The minimum supported hoop size is 5" X 7"
Copyright © 2011-2018 Queen of Stitiching, Inc. - All Rights Reserved.